We all learn things in different ways. Some are more hands on than others, some learn better with visuals aides, while others grasp the theoretical aspect before the practical. The same process holds in regards to how we learn to drive. Some individuals pick up the concepts relatively quickly, where other may struggle and some prefer to learn over a longer period of time, while others learn more effectively when they’re able to practice consistently over a number of days. For those who learn better when they’re able to spend a considerable amount of time in the car with their instructor, a residential driving courses may suit their learning abilities and enable them to pass their driving test much quicker than they otherwise would. What Are Residential Driving Courses? A residential driving course is an intensive driving course which lasts a number of days and requires students to stay over for duration in a pre-determined location. Often the driving school administering the course will house the pupil in a nearby hotel and each day they’ll receive up to 6 hours intensive tuition per day. What Are The Types of Courses And How Much Do They Cost? Residential driving courses vary in their length and there are courses to suit learners at different stages of their progression. There are hyper intensive courses aimed at learners who have had under 10 hours tuition and these normally consist of between 30 and 40 hours instruction, spread over 5 – 7 days. The average cost for a hyper intensive course of this nature is between £700 and £850. There are shorter courses aimed at drivers who have recently failed their test and these normally consist of between 12 and 18 hours tuition spread over 2 – 3 days. The average cost of the shorter course with full accommodation ranges between £450 and £550. What Are The Benefits Of A Residential Driving Course? Not everyone will be suited to taking a residential driving course. Driving for 6 hours a day can be tiring and if you often struggle with information overload, you could find yourself feeling saturated and unable to take on new concepts. If however you feel you an intensive driving course of this nature would suit your learning style, there are several benefits to taking this type of course. One major benefit of a residential driving course is that you’re able to practice in and around your potential test route. Your driving instructor will be aware of the local test centres and the potential routes taken on test day and they should have you practicing on each of the potential examination routes. If you are familiar with the local area, your’re more likely to remain calm and relaxed through the duration of your test and this should increase your chances of passing. 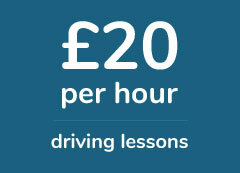 Leaving too much time between driving lessons is a major cause for lack of progression among new learners. Leaving weeks and in some cases months between lessons makes it much harder to grasp the concepts they are taught. A majority of learners should schedule practices within days of each other to really start to see the benefits of their tuition. In most cases a student will learn more effectively when they’re able to quickly put into practice the new concepts they have been taught and this is what makes residential driving courses a great way to improving your driving relatively quickly. Whenever we’re able to concentrate and focus on one particular task, we often perform very well as a result and learning to drive is no different. Being away from home and the routine of everyday life, allows the students to focus solely on driving and often it’s the complete dedication to the task that leads to the most improvements. One of the main attractions of the residential driving course is that the residence tends to be in a quieter part of the country. Many courses are situated in the countryside, meaning less traffic, no dual carriageways and a shorter driving test queue, meaning you’re more likely to get a test slot at the end of your scheduled tuition. Quiet test centres often have higher pass rates then centres in the major towns and cities and this is a draw for anyone thinking of booking this course. What Do I Need To Be Aware Off? i. Are All The Lessons One to One? The whole idea of a residential driving course is to create an environment where the student is able to receive continuous tuition for a set period of time, through one to one lessons. Driving for 6 hours at a go can be tiring and many driving schools attempt to maximize their profits by adding an extra student to the car to create a shared lesson. In doing so they are able to maximize the instructors time by teaching for 6 hours but getting paid for 12, while the student receives 3 hours effective tuition instead of 6. When booking your residential driving lesson ensure you enquire with the driving school as to whether lessons will be strictly one to one or shared. ii. What Happens If You Fail Your Test? iii. Does The Advertised Price Include Accommodation? In the main residential driving courses can be expensive. Although you should be paying for high standard of tuition and an intensive lesson, it’s worthwhile checking if the advertised price includes accommodation. If the individual is required to source accommodation at their own expense, the total price for the lessons and accommodation may prove to be too expensive and not worth the investment. Residential driving courses are a great way to improve upon your driving and you should hopefully pass your test in a relatively short period of time. If you can dedicate the time and have the budget available, they’re definitely a course worth taking and if you would like to some additional information on available courses, fill in the form below and one of our friendly team will get back to you shortly.